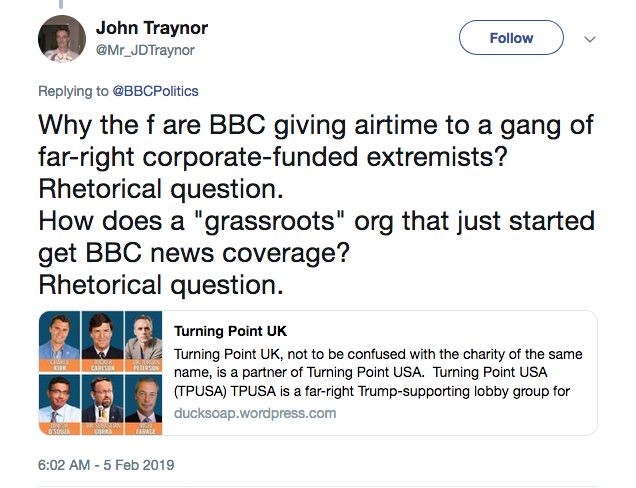 Since the launch of alt-right campaigning group Turning Point UK, there has still been no word as to who is putting up the money for the UK chapter of a US original which has been accused of links to white supremacist and other less than totally desirable far-right groups. 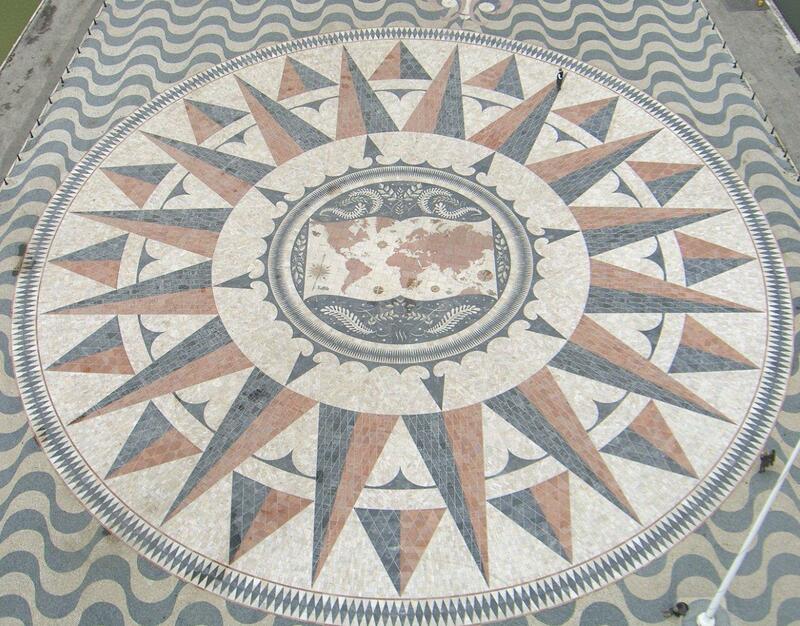 Nor, indeed, has there been much high profile activity from those who have put their names to the enterprise. Not much more noise from their sympathisers, either. 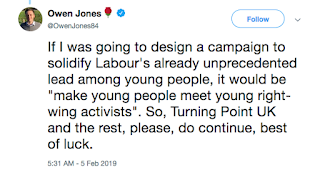 But what there has been is a torrent of ridicule and derision, enough to show that Turning Point UK is likely to benefit the political process in this country - except not in the way in which its founders and principals intended. Parody “branch” accounts have sprung up across the Twittersphere. 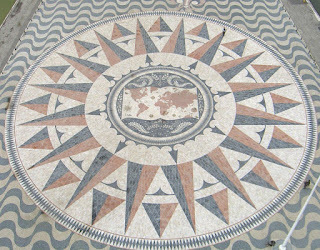 Those featuring in the group’s launch have been royally rinsed. It is almost as if someone were deliberately spraying into the wind. Turning Point UK’s own publicity is clumsy and counter-productive: take the claim “7 Reasons Brexit is Great for Business - featuring businessman @LanceForman WATCH the full video here”. Lads, lads, how shall I put this? HE’S YOUR CEO’S DAD. Can’t you get someone not connected to the group? And it gets worse. 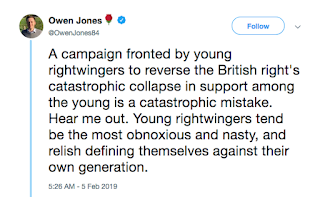 “Young people are not puppets to be used in the Left’s narrative. We think for ourselves. We act for ourselves. We vote for what we believe in and we believe in a freer society. Smaller Government = Bigger Freedom” they proclaim. But they aren’t thinking for themselves. 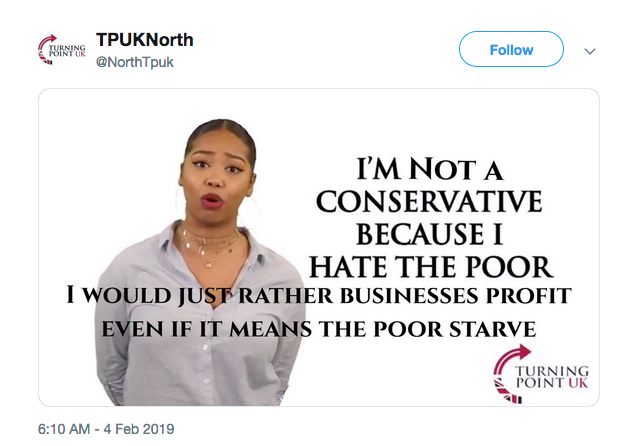 They’re being paid to shill for the right-leaning establishment. 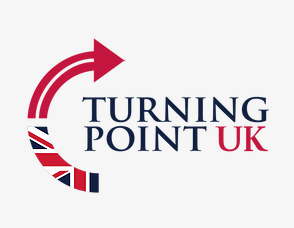 The upshot, though, can be put directly: Turning Point UK is proving to be a great recruiting sergeant. But for the opposition. And there are more benefits. 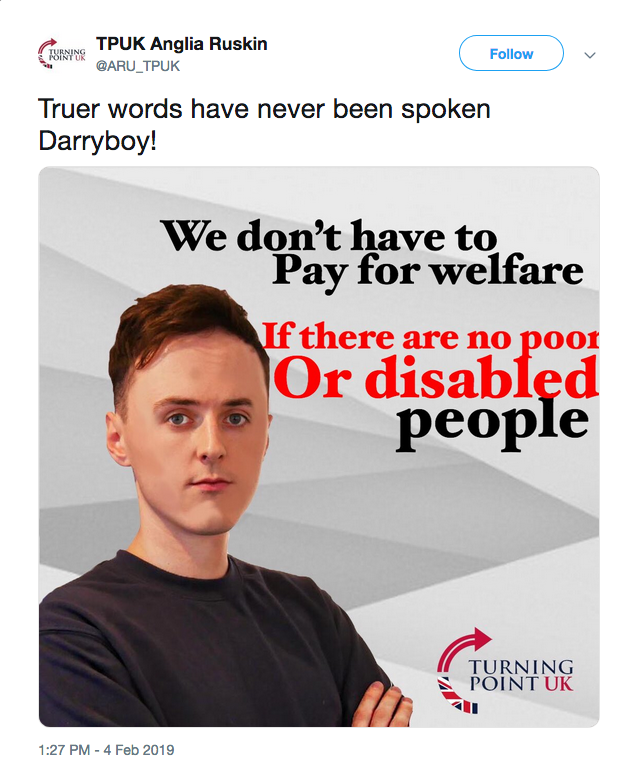 One, the tsunami of derision is forcing the principals of Turning Point UK, and those of like mind, to see just how the rest of the world sees them. Far from awe and deference at all those media appearances they manage to secure, most who have an opinion on them consider them a bunch of overprivileged and irrelevant tossers. 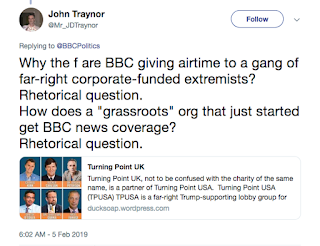 Two, the ridicule might just make those who do the booking for the BBC’s politics shows, and indeed those carried by other broadcasters, think twice about putting this junior horror show on Politics Live, or TalkRADIO, or LBC, or Channel 4 News. 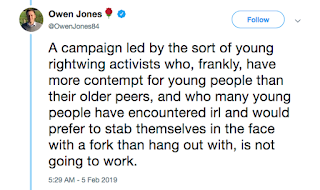 Three, as Owen Jones has put it, “Young rightwingers tend be the most obnoxious and nasty, and relish defining themselves against their own generation … A campaign led by the sort of young rightwing activists who, frankly, have more contempt for young people than their older peers, and who many young people have encountered irl and would prefer to stab themselves in the face with a fork than hang out with, is not going to work … If I was going to design a campaign to solidify Labour's already unprecedented lead among young people, it would be ‘make young people meet young right-wing activists’”. Quite. And Four, the longer this clown car is allowed on the track, the more damage it does to itself, its supporters, and the right generally. Nothing in recent politics has shown more clearly the lack of self-awareness of the right-wing elite and their youth wing. 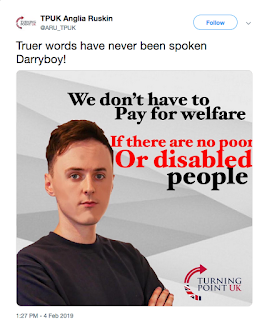 So don’t stop now, Turning Point UK - we all need a good laugh once in a while. If Turning Point UK is using the same money as its US parent then IBT, Vice and Politico has some answers.. 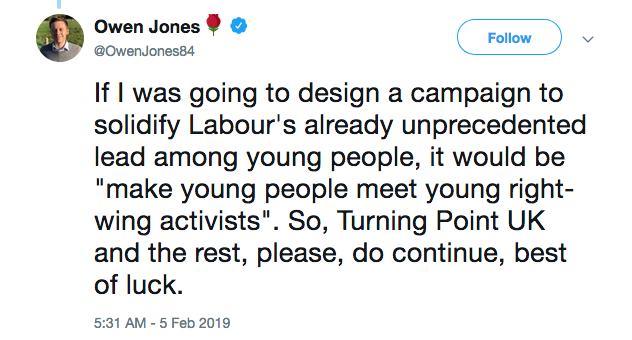 The real turning point will be when they disappear up their own collective arse. The young lady interviewed on the BBC said people in the student union were mean to her. Why is a right wing "activist" in a union when unions are the very antipathy of right wingers and certainly her US $Billionaire backers?. 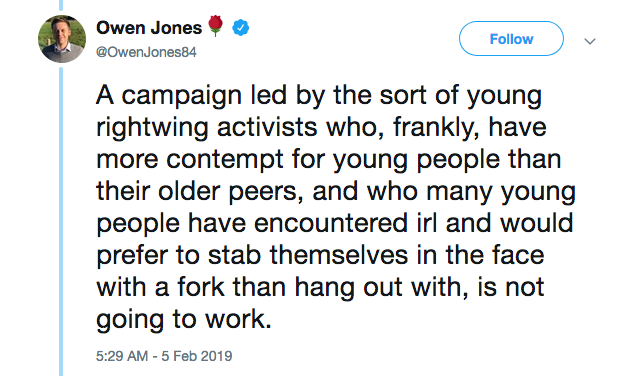 Jones is correct in this- the lack of self awareness and vacuousness of this phony movement will make it become a laughing stock.